Where do golden generations come from? Political involvement in football dates back as far as we can remember. Even the origins of modern football are delved in political intrigue, when the inhabitants of a small east English town played a game of football with the decapitated head of a Danish prince. In the 1950’s, Real Madrid were accused of receiving special treatment from Spain’s president/Caudillo, general Francisco Franco, who allegedly granted them automatic qualification to the 1955, 1956, 1957, 1958 and 1959 European cups, a participation normally granted by France Football. Real Madrid went on to win the competition 5 successive times facing little to no actual competition and bending the rules all the while. The Soviet Union’s national football team was briefly accused of doping their athletes during the 1960 and 1964 European championships and 1966 FIFA world cup, FIFA officials were accused of favouritism towards the host nations of South Korea and Japan at the 2002 world cup and were shrouded in controversy once again when they awarded the 2022 world cup to the oil-rich nation of Qatar, often accused of human rights violations. Although political intervention in association football has gone down since the days of Franco and Ponedelnik and it has shifted mostly towards financially driven interference, there is a phenomenon that has rarely been touched, the political roots of “golden generations”. A golden generation is defined as “an exceptionally gifted group of players of similar age, whose achievements reach or are expected to reach a level of success beyond that which their team had previously achieved.”, the common misconception with golden generations is that they are a feat of luck or chance, but that is as far from the truth as possible. Golden generations materialise due to a range of social and political factors at the time, often overlooked by the footballing world, so I wanted to examine a few notable examples of golden generations to clarify the impact politics have on the footballing world. Ronaldo, Rivaldo, Kaká, Ronaldinho, Roberto Carlos, the list goes on and on. Brazil’s ’72-’82 generation were the team to beat in the mid-to-late 90’s and early 2000’s. Their trophy cabinet suddenly grew as they won the 1994 and 2002 world cups, the 1997, 1999 and 2004 Copa Americas and the 1997 and 2005 confederation cups as well as finishing second in the 1995 Copa America and the 1998 world cup. But how did this generation come to be? To find the answer we must go back to 1974, when petroleum giant, retired general and conservative candidate Ernesto Geisel won the presidential election by 84%. While it is true that this was a largely unfair election, being held under Brazil’s military dictatorship at the time, that’s not what concerns us. What concerns us is the impact this election and the successive 1978 and 1985 elections had on Brazil’s footballing youth. The three presidents we’re examining, Ernesto Geisel, Joao Figueiredo and Tancredo Neves were all presidents under Brazil’s 1967-85 military government, notable for its stringent anti communist stances. All three presidents are remembered as the first to push Brazil onto the path to democracy, but being so engulfed in making such radical changes, they had little to no time to deal with Brazil’s social climate, which at the time was still one of a third world country. Street football was also still on the rise. Young boys grew up in awe of Brazilian legend Pele, and were inspired to reach such heights themselves. Meanwhile, the government had bigger problems on their hands than the future generation, and in the traditional Christian country Brazil was, discipline was key. Such discipline could be achieved by young boys in playing football, a team sport. More and more clubs in small towns and big cities alike set up academies for the young and talented, and at no point were the children persuaded by their mentors that even dirt poor favela children like them could achieve academic success, something seen as a heavily socialist stance at that time. 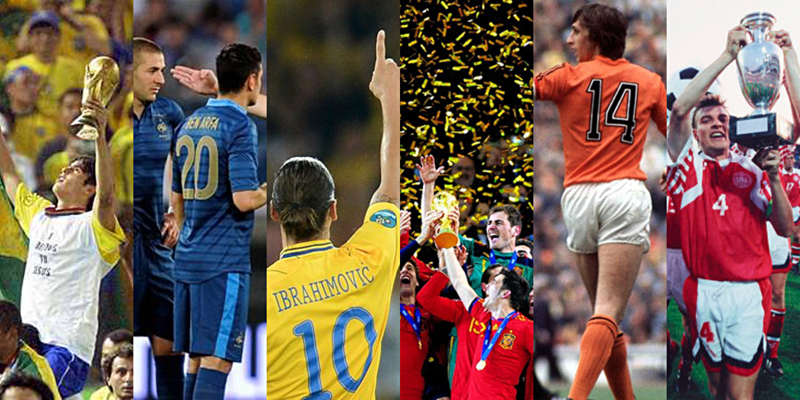 That is the cornerstone of a golden generation. When the officials play the narrative that young, impoverished boys can achieve discipline and success through academic performance, a narrative almost exclusively played and pushed by left-wing governments, it sways them away from becoming great footballers. Another golden generation that highlights this feat, perhaps less successful in their adult life, is France’s Generation 1987. Benzema, Ben Arfa, Nasri, Menez; after winning the 2004 UEFA European Under-17 championship, expectations were high, very high. France’s Generation 1987 were already favourites for the following 2010 world cup and EURO 2012, but their promise never materialized into success. Whether that be because the pressure was too high or because they eventually lacked the composure to become a team of world-beaters, the raw talent was and still is there. However, their success is beside the point. How did this generation come into existence? Despite being born in 1987, the year before Socialist president Francois Mitterand retained his position as president, RPR (France’s conservative party, today Les Republicains) had the parliamentary majority, and RPR’s leader Jacques Chirac (who went on to win the following election) was given control over the country’s domestic policy. This was also 25 years after Algeria’s independence from France, making Generation 87 majority Franco-Maghrebi. Eight years after the birth of most of Generation 87‘s players, Jacques Chirac, Mayor of Paris at the time and former prime minister of the country, won the 1995 Presidential election, staying in L’Elysee until the 2007 presidential elections where he was succeeded by his heir within the party, Nicolas Sarkozy. Chirac’s two-term reign oversaw most of Generation 87‘s childhood. Amongst many other things, Chirac is remembered for being a controversial figure in France’s banlieues, characterized by civil unrest and protests in the Parisian suburbs in 2005, following the death of two young boys in Clichy-sous-Bois. His lack of social policies in the economically disadvantaged areas of the banlieues, highly concentrated in immigrants, was often challenged and seen as a naive move such short time after Algeria’s independence, causing decades of social division between class and racism. In the footballing world however, this had a somewhat positive impact. While social cohesion dissolved and although football academies weren’t opened, something Chirac made sure of was an abundance of football pitches in HLM neighborhoods (Neighborhoods heavily concentrated with immigrants, mostly living in high-rises, known as HLM) and in schoolyards alike. While young Frenchmen, typically second-generation immigrants, weren’t encouraged to pursue an academic career, and to make up for their boredom in the classroom and dull life at home (parents usually worked multiple jobs for long hours to pay for even basic housing), these adolescents would spend every last minute playing football in underpasses, abandoned streets, basketball courts or velodromes, perfecting skill before even beginning to play on grass. While you could look at Sweden’s 1958 world cup squad, their euro ’92 squad or their USA ’94 squad for stars, having been the only “golden generations” in recorded Swedish football history, Very recently there was a “what could have been” generation, much like France’s Generation 87. With names like Daniel Majstorovic, Henrik Larsson and, of course, Zlatan Ibrahimovic, in the early 2000’s the Swedish national team was hot property, destined to cause many upsets in forthcoming tournaments. The early 2000’s generation is truly a “what could have been” generation above all else, but in principle they remain a golden generation for the sake of this piece, seeing as their future was expected to be one of great success. An interesting question could be to ask what drove to the failure of this generation? Arguments could be made that the level of competitive football in Sweden just isn’t high enough, that most of the players didn’t play in the same league or that, like nearly every single Scandinavian golden generation ever to come to fruition, the culture just doesn’t let it happen. That question is a story for another time, however, because although most people could at least guess why or how Scandinavian golden generations fail, the more interesting question is how they get to that point in the first place? What drives the creation of a golden generation of footballers in a country that is so unfamiliar with the values that drives youth to pursue sport? If, as mentioned before, a predominantly conservative style of governance that creates urban hardships is what leads to the emergence of talented footballers, how could this happen in a country like Sweden? Well, although Sweden’s governments have been predominantly left wing since the mid 20th century (even if the government was dubbed “conservative”, a conservative party in a welfare state like Sweden isn’t the same as what we consider a conservative party in most of the western world), these left wing governments do bring something to the table that right-wing governments don’t when it comes to football: immigration. When we looked into France’s Generation 87, I pointed out how most of the second generation immigrants who became footballers endured hardships in the economically defavorised banlieues, but for them to be hardened in those conditions in the first place, those conditions must be created, and what better way to create them than through immigration? It is no secret that mass immigration leads to a heightened concentration of economically defavorised members of the population in the suburbs and moreover, leads to crime through ethnic tensions. Children of poor immigrants are taught (either through family or friends) to disobey the state, portrayed as evil and trying to control the immigrants’ every move through the police; a rendition of George Orwell’s 1984 set in the suburbs of Malmö. So although Sweden’s left-wing welfare state government promotes (and usually achieves) a high standard of education throughout the country, the children in the suburbs have a natural disdain towards school and education, as much as in a conservative country like France, where the immigrant population felt ignored in the first place. What have we learnt so far? Well if we draw together the similarities from the first 3 examples, a possible conclusion is that a Golden Generation comes as a result of either socially conservative politics (Brazil), a high concentration of immigrants in suburbs (Sweden) or both. But that would be blind. What about countries like Spain, where their World Cup-winning squad of 2010 had almost no players who were first or second generation immigrants? What about countries like the Netherlands, where, over the ages, many decorated squads have come to fruition in a country largely regarded as socially un-conservative, where sports are not seen as a retreat for the unprivileged, but as a normality? Or what about countries like Denmark, who’s 1992 Euro-winning squad was ethnically 100% Danish and was bred in a country known for it’s social welfare policies? Let’s take a look at these 3 examples to cover all the bases, because as you’ll find out, all 6 examples have things in common. Winning 3 major trophies on the international stage in the space of 4 years is no easy feat, perhaps even an impossible one. Yet, between 2008 and 2012, Spain finished every major competition they entered on the top of the podium, champions of Europe and the world. It wasn’t just the international stage where their success went unrivaled, either. In the space of 4 years, a Spaniard was on the Ballon d’or podium six times, a Spanish team won the champions league twice and a Spanish team won the europa league twice. Spain had truly hit gold when it came to a golden generation. The likes of David Villa, Fernando Torres, Iker Casillas, Andres Iniesta and co were the team to beat in Europe, and their results proved it. What led to this team coming to fruition then? As I pointed out, this team lacks racial diversity (not to say that is necessary in the creation of a golden generation) and thus the creation of friction in suburbs. Is it politics then? Luckily for us, the Spanish electoral cycle has made it easy to deduce the political tendencies of the country, as the Partido Popular (People’s Party), the largest conservative party in Spain, won two consecutive elections in 1996 and 2000, spanning the childhood and early adulthood of most of the players in this generation. While we could cut this part short and guess that conservative social parties led the economically defavorised Spanish suburban youth to find refuge in football, that’s not quite the case. Firstly, did the players of the 2008-2012 generation experience hardships? Yes. Spain isn’t a particularly lavish country today, let alone two decades ago, and I can’t remember the last time I’d heard of a big player who had made it because of all the money that had been spent on academies and training. Most footballers are modest, that is a fact. I’m not going to question whether or not Casillas & Co endured hardships on their way to the top, because that is a given. With that out of the way, why shouldn’t we accept the easy answer and move along? Because it doesn’t cover the full story. Ask nearly any spaniard, and they’ll tell you that they can’t tell the difference between left and right anymore, that the government is so corrupt and dynastic, and that in the suburbs, the government has always been looked down on. While elections in France, Sweden and Brazil often ushered in reforms in the suburbs or in the education system, the Spanish social system and education system has remained stagnant, budging for no party, left or right. This adds another degree of intrigue to the mystery of golden generations, the fact that the hardships that drive young footballers to greatness sometimes spawn from political ignorance instead of a change in the political environment. All of this is also without mentioning Spain’s deep-rooted football culture, a culture where all boys are encouraged to pursue sports, where football is seen as a universal ideal and where joining football academies and youth teams is second nature. When I first began theorizing as to how and why the Netherlands constantly pump out golden generations in football (1974, 1998, 2010 etc), I fell into the trap of looking back on the last few countries I analyzed to find a pattern. The problem was, there was none. The Netherlands are an extremely prosperous country with high standards of living (even in relatively poor, minority-charged suburbs) and one of the least corrupt political landscapes in the world (thus eliminating all the previous criteria), so how and why could this happen? The answer is what sets the Netherlands apart from most other countries in the world, the reason they consistently produce gifted players without exception (even though they don’t have many trophies to show for it). If you haven’t already guessed it, academies are the answer. While modern football academies are being built and upgraded all over europe, they’ve been the centre of dutch football for years, especially since the “Cruyff revolution”. After asking around for some dutch opinions on their favourite golden generations and their theory as to how said generations came to life, the answers were nearly unanimous: Academies. For years, dutch football has been ten steps ahead of everyone else when it came to academies. The great Johan Cruyff pioneered the concept of putting youth development at the heart of a football club, especially in financially challenged suburbs, something that had helped him a lot in life and as a footballer. Since then, “dutch schooling” has become a renowned system for players to go through, whether they be dutch or not (i.e Luis Suarez, who has often praised the manner Ajax and Groningen go about “educating” players to make them better footballers). This systemized process works so well in the Netherlands because it’s built to help the player not only as a footballer but as a person as well, incorporating school and social life with football, much like at FC Barcelona’s La Masia academy, the difference being that in the Netherlands academies aren’t reserved for the best of the best. Dutch clubs don’t just pour money into youth academies like english clubs do, they tailor them and perfect them so they’re accessible to all and give players a platform to improve on themselves, not a spotlight they’re forced to shine under. May 1992. The stage was set in Sweden for the ninth edition of the european football championship, to be contested between 8 of europe’s greatest teams, not including Denmark. Fast forward just under 2 months later and Lars Olsen was lifting the Henri Delaunay trophy in Stockholm after overcoming world champions West Germany 2-0. Euro ’92 remains to this day one of football’s greatest stories, and undoubtedly, Denmark’s highest footballing hour. While criticism of Denmark being allowed to participate and criticism of the tactics they adopted can still be discussed, that’s not the question at hand. The question is how and why Denmark, a very developed country with a noticeably high living rate, produced this golden generation. We can already knock poverty off the wipeboard and mass immigration too because the team was entirely ethnically danish. Authoritarian rule can also be ruled out, as Denmark was (and still is) one of the least corrupt countries in the world. What about academies then? Again, false. Danish academies like FC Midtjylland’s are picking up the pace nowadays, but they’ve never been notably impressive, and especially not in 1992. The missing piece of the puzzle here is something that occurs in very few countries, and not very often: outsourcing. While nowadays this isn’t very special, 7 danish players from their euro ’92 squad were playing their trade abroad and a further 6 had played abroad prior to the tournament. This also coincided with the Laudrup brothers’ prime (who didn’t participate in the competition because of a long-term dispute with manager Richard Møller-Nielsen), both playing abroad at the time. While danish clubs don’t have spectacular academies, players quickly realised they’d fulfil their promise abroad, at more developed academies in Germany, the Netherlands and Spain. This has been the case with Belgium’s recent golden generation, where most players not only play abroad, but moved abroad at a rather young age. Combining a comprehensive youth system with a competitive league to throw players into is very difficult to achieve (Spain, Italy and the Netherlands being the only countries to consistently do it), and thus some countries send their best and brightest abroad to achieve new heights. So, is there a recipe to success here? The short answer is no. It’s like saying there’s a universal recipe for chocolate cake regardless of ingredients. This isn’t the case at all. Install a fascist regime in the Netherlands and you won’t get immediate results. If you establish ghettos in Denmark, you shouldn’t expect them to win the world cup in 25 years. Each key only works in it’s ideal context. We can, however find some common traits. Academies are the closest to failsafe as you can get. Any country with a highly advanced and intelligently developed academy network can and will do well, as long as it’s well structured. This means opening academies to a larger amount of children, making them less exclusive, integrating them with education and life skills, building the necessary infrastructure and appointing thorough coaches. It’s a long process, but it’s underrated. In England, there aren’t many big academy products, and if one does pop up, he’s instantly the poster boy for a “new generation” of english footballers (I haven’t talked much about the media, but especially in England they’re a big part of the problem). It’s no secret that uncontrolled large-scale immigration in the 20th and 21st century nearly always leads to impoverished neighbourhoods and inadvertent segregation, but that is the byproduct of multiple political factors. One of the byproducts of this immigration is a constant flow of talented youngsters with nothing to lose who finally get a stage to prove themselves on when academics just don’t cut it. The concrete jungles of north Paris, south-east London, central Malmö and many others are an endless conveyor belt of foreign talent, hardened by the street and relative poverty. Governments who promote academic achievement in suburbs are largely responsible for the lack of golden generations (mainly) in developed countries. While the academic curriculum promotes sport and team activities, there’s a distinct bar between casual football and full dedication. The bar is never lowered on purpose, it occurs out of pure ignorance and the lower the bar, the higher the probability of a golden generation occurring. Of course, this is only in countries who have clubs and academies to take players in, unlike in south-east asia and sub-saharan Africa, where poverty is so high, there are no academies to adopt talented youngsters. In most countries though, this is the case. Immigration lowers the bar, small government lowers the bar, economic crises lower the bar, and so on and so forth. Anything that challenges a country’s ability to prioritise education is an inadvertent stepping stone for another golden generation. On paper, social cohesion brings the level of football down. Whether it be because of a somewhat disinterested government like in Brazil, an education system yet to catch up with the high demands of large-scale immigration like in France or Sweden or a working-class youth with an abundance of time like in Spain, this is where societal questions start to be raised. As the battle between multiculturalism and conservatism intensifies more and more, it leads us to unexplored territory. Badly regulated multiculturalism and recent financial crises has led to a fantastic recent generation of young footballers, but is it worth it at the expense of the hundreds of thousands of children who miss out on advanced education because of this system, yet don’t make it as footballers? While the lack of prioritisation of education gives young footballing talents better tools to succeed, they’re a minority compared to the hordes of children who miss out on their education because of this. On the other hand, if we find a less rocky path to a more developed world, where more and more countries can prioritize education, will the footballing industry have to make major changes? What if France’s suburbs looked more like Denmark’s? Would the FFF be forced to invest massively in academies to catch up with other countries? A more developed world might mean a less competitive football world, more and more countries might end up like Norway or Switzerland, with very little footballing talent. It might also mean the sudden resurgence of less developed countries, who can finally play catch-up with european powerhouses. It is unchartered territory and although it may be a moral battle, we can’t draw any solid conclusions about the future of football compared to the future of politics just yet. The only thing we can be certain of is that there are trends in football that have deep roots to politics, no matter how much we don’t see it, or how much we don’t want to. ~Special thanks go out to Max, Thomas (@andofootball), Abdul (@Flaminiesta), Malte (@Malteinstein), Jonathan (@Crexativea) and many others for their help in making this piece a reality by providing invaluable information.